About the Brand: A brand synonymous with safe and efficacious herbal products, Himalaya Herbals was founded in 1930 by Mr. M. Manal with a clear vision to bring Ayurveda to society in a contemporary form and to unravel the mystery behind the 5,000 year old system of medicine. Himalaya has pioneered the use of modern science to rediscover and validate ayurveda's secrets. ISO 9001:2000Cutting edge technology is employed to create pharmaceutical-grade ayurvedic products. The company has focused on developing safe, natural and innovative remedies that will help people lead richer, healthier lives. Explore the entire range of Diapers available on Nykaa. 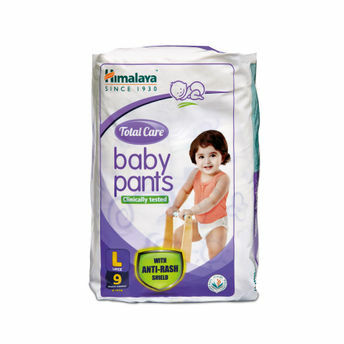 Shop more Himalaya products here.You can browse through the complete world of Himalaya Diapers .Alternatively, you can also find many more products from the Himalaya Total Care Baby Pants Large range.